A Turkish customer has returned to Siwertell for a second road-mobile unloader following the performance and reliability of its first machine; it will be used to handle cement in the popular tourist city of Trabzon, Turkey. Siwertell, part of Cargotec, has secured a new order for a Siwertell 5 000 S, trailer-based, diesel-powered unloader with double bellows system and dust filters. It is destined for operation by Muhammet Gümüstas, in the Black Sea coastal city of Trabzon, Turkey. In 2012, the cement services company commissioned its first Siwertell unit, a 10 000 S unloader. Both units are dedicated to cement handling at a rated capacity of 300t/h. "Muhammet Gümüstas ordered a second unloader because of its favourable experience with the first unloader, and because of Siwertell's reputation for delivering one of the most reliable unloading systems available on the market today," says Jörgen Ojeda, Sales Director for Siwertell Mobile Unloaders. "The unloader's flexibility and capacity, combined with low operational and maintenance costs, also had a major impact on the client's decision." 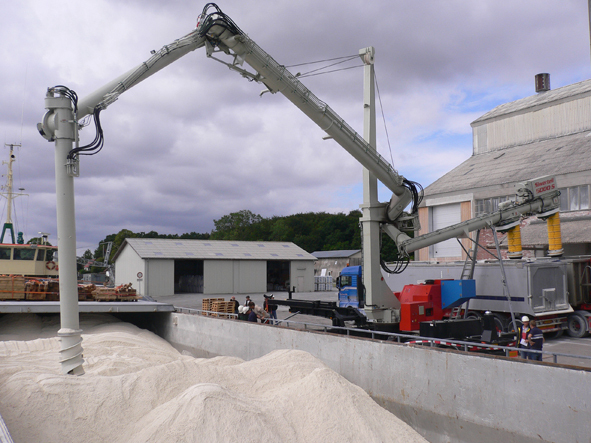 "With more than 400 units delivered to the market since 1974, 100 of which are mobile systems, we have positioned ourselves as the market leader in bulk material handling. "Its unique design makes the Siwertell unloader one of the most environmentally-friendly shore-based ship unloading systems available," adds Mr Ojeda. "Dust-free handling and low energy consumption, along with minimal exhaust and sound emissions mean that it can be used in sensitive sites and those close to populated areas, such as Trabzon, which is a popular tourist resort." The new unloader will be built in Bjuv, Sweden; delivery is scheduled for May 2013.